Success was in doubt for a time, but all participants eventually extricated themselves from the low-tide mud along the Duwamish River, Squad’s 100% survival rate is intact, phew! 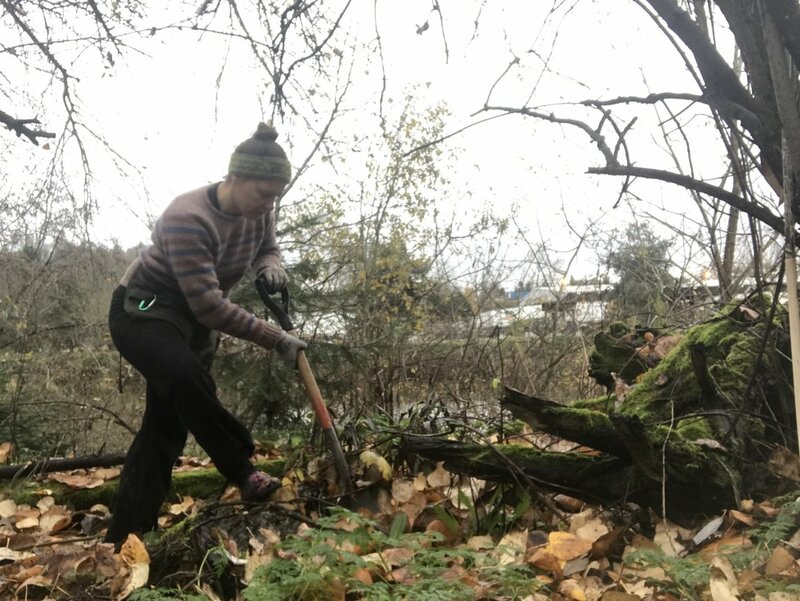 The Duwamish Alive Coalition has done many important works of restoration, and preservation along Seattle’s river and we appreciate having Sharon lead us on the ground in some hands-on stewardship at North Wind’s Weir. While working, we were treated to eagles, heron, kingfisher and many sitings of a seal. We planted some carex divisions (off of larger plants) from another thriving site that will hopefully root themselves in securely before the tide, waves and geese pull them out. Additionally we planted live willow stakes which will sprout roots from the dormant branch cuttings when submerged in wet ground. This site is important for Chinook salmon as it is the transition zone between fresh water and salt water. Read more about the fascinating Native American legend around this important site on Wikipedia and from the Burke Museum. Green River Restoration & Hopeful Salmon-Viewing. The Green River Natural Area at O'Grady has been a favourite spot for seeing pink/humpy salmon, whom spawn only in even-years. Unlike 2015 when the fish were incredibly thick, it was hard to spot them this year. Still the Green River (which turns into the Duwamish) is beautiful and offers visitors many pleasures, which the children in particular happily took advantage of. 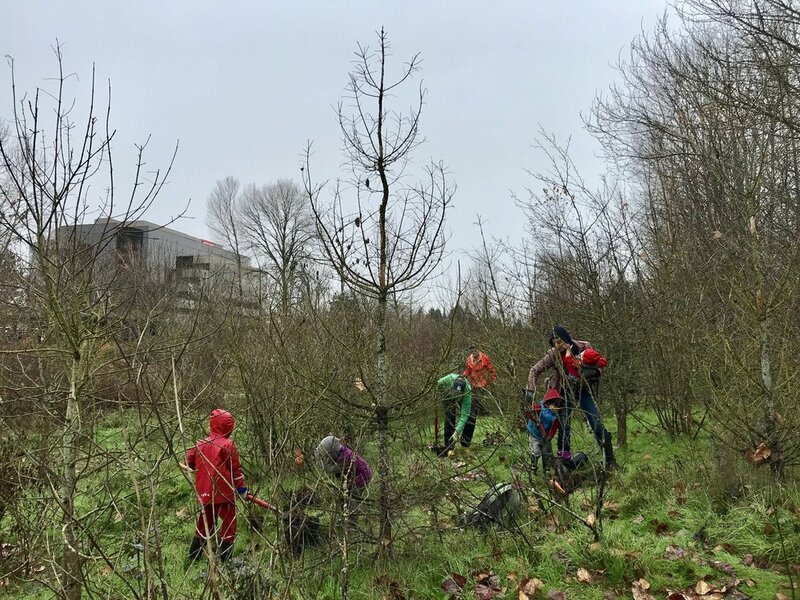 We worked with King County Parks to dig blackberry and stinky-bob out of original restoration sites, seventeen years old, and towered over by native cottonwoods. A good portion of these original restoration plantings were swallowed up by the meandering, natural river, but such is the way in a riverine habitat. It is a treat to be able to have the gate opened to drive down to the river during work parties- otherwise it is inaccessible to cars due to the winding mile-long one-way road. The horses out for trail rides were very fun to see. And even the drive itself, out to the outskirts of Enumclaw with lovely, with it's bucolic farm lands and view of Mt. Rainier. Views and Sheet Mulching at Duwamish Hill Preserve. We enjoyed the full spring weather experience at the Duwamish Hill Preserve with moody skies, sunny skies and quick torrential downpours. The new section of the park showcasing a variety of non-forest habitats, such as prairies and wetlands is opening soon. Our task was to finish sheet-mulching the last corner. We picked trash, leveled ground, placed cardboard and hauled mulch. You can go back on the blog and read more about the Duwamish Hill Preserve here. This gem of a park has views of both Mt. Rainier and Downtown Seattle, Native American history and fascinating geologic and fossil history. Not to mention fun trails and rock outcroppings to run around on. Squad on the Duwamish River. Steamy mulch. We have worked many a task at Stewardship Squad, from wielding the weed wrench, to hauling stones and of course weeding, planting and mulching. This time however, was our first for sheet-mulching on a large-scale. The native plants contend with hedge bindweed (Convolvulus sepium) and poison-hemlock (Conium maculata) at the riverside restoration site- the cardboard layer underneath the woodchips helps smother existing rhizomes, plants and seeds. This restoration project was begun by an interested employee at the adjacent BECU headquarters, who's employer supported the efforts and they grew! Other partners and the City of Tukwila are involved now. May we all be as inspired to better our surroundings. The Homeschool Stewardship Squad was happy to help. And glad for the steamy mulch piles on a chilly day.